Prussian town near Frankfort-on-the-Main. A Jewish community existed there probably as early as the middle of the thirteenth century, for it appears from the municipal archives that the legal status of the Jews was determined as early as the year 1290. The town is especially noteworthy for its Jewish printing-presses. Carl Reich owned a press in the middle of the eighteenth century, publishing among other works Y. Zamosc's "Ḥedwat Ya'aḳob" (1751), Samuel Friedberg's "Birkat ha-Ḥodesh" (1753), and Meïr Levi of Zolkiev's "Miksheh Zahab" (1757). 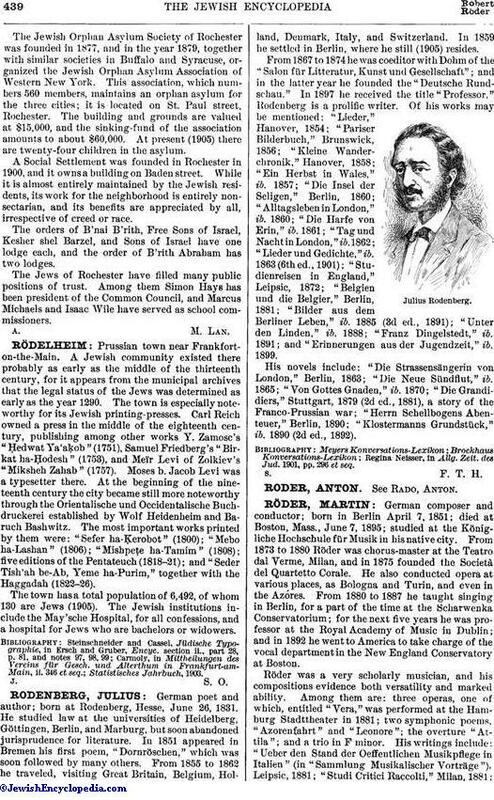 Moses b. Jacob Levi was a typesetter there. At the beginning of the nineteenth century the city became still more noteworthy through the Orientalische und Occidentalische Buchdruckerei established by Wolf Heidenheim and Baruch Bashwitz. The most important works printed by them were: "Sefer ha-Ḳerobot" (1800); "Mebo ha-Lashan" (1806); "Mishpeṭe ha-Tamim" (1808); five editions of the Pentateuch (1818-21); and "Seder Tish'ah be-Ab, Yeme ha-Purim," together with the Haggadah (1822-26). The town has a total population of 6,492, of whom 130 are Jews (1905). The Jewish institutions include the May'sche Hospital, for all confessions, and a hospital for Jews who are bachelors or widowers.